Let’s Talk About Food and Us. 1. Cholesterol is not our enemy, cholesterol is essential for all animals including us. 2. Consume good fat, Eggs contain high in good fat. 3. The best quality eggs are USDA Organic pasture-raised, it is pricy but contain 3times as much nutrients than conventional eggs (Caged). 1. Is Egg Bad for Your Heart? It’s true that eggs are high in dietary cholesterol, One egg contains 186 mg of cholesterol, all of which is found in the yolk but they’re low in saturated fat, which is the bigger culprit when it comes to raising blood cholesterol levels. Because of this, eggs get the green light according to the government’s 2015-2020 Dietary Guidelines for Americans. In fact, one recent meta-analysis found that higher consumption of eggs (up to one egg per day) is not associated with increased risk of coronary heart disease or stroke. And a 2016 Finnish study involving more than 1,000 men concluded that egg or cholesterol intakes are not associated with increased risk of coronary artery disease, even in those who are genetically predisposed to experience a stronger effect of dietary cholesterol on blood cholesterol. Yuka was talking about Cholesterol in depth. If you want to know the details about Cholesterol I would recommend listening to what she says. Here I will briefly write down the important points she was making in her talk. “Cholesterol is not our enemy and it is essential to our body”. Yuka repeated. It composes about 30% of all animal’s cell membranes and modulates its fluidity over the range of physiological temperatures. It is actually your liver that makes more than 70% of your cholesterol needed. About 1000 – 2000mg cholesterol is actually needed for average men a day. An average 185mg cholesterol of one egg does not really affect you as much as we used to think. Typical daily cholesterol dietary intake for a man in the United States is 307 mg. This also tells us that dietary intake of cholesterol does not really matter. I talked about my result of the blood test for cholesterol levels. Here is the result. OK, I admit my LDL and total are border high. 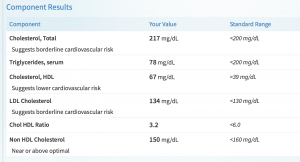 But this does not really tell much about my heart disease risk. The ratio between Total Cholesterol and HDL is 3.2, and less than 6 is recommended and ideal is told 3.5 by some forward thinking health practitioners. Triglycerides verses HDL is also less than 2 which is also good. These ratios are more reliable than just looking at “Total Cholesterol” level. Simply no cholesterol level is equal for all human-being. Heart disease risk also should be assessed by many other factors like his/her lifestyle – diet, smoking, alcohol, exercise and genetic data and blood sugar level. Though I do not care too much about what my doctor told me, I just stopped licking a stick of butter too much. Also note that I read many Japanese Health web sites that were talking about increase level of LDL after being Ketogenic diet (Which is now very buzzing diet in the US especially in the bio-hackers, Silicon Valley executives in Bay area and weight control community) for a while. I am not endorsing Ketogenic to everyone because root philosophy is “Not one diet fits everyone”. Keto Diet maybe good for some but also cause bad effect for some. Most important thing is to be always mindful and listen to your own body and try a new diet theory slowly. It may be how you prepare eggs? One large poached egg has 71 calories and 2 grams of saturated fat, and an omelet made with spinach and one yolk is also a lean choice. 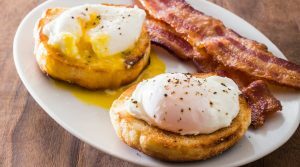 But a serving of eggs Benedict with bacon and Hollandaise sauce has about 800 calories and 26 grams of saturated fat. So feel free to enjoy eggs, but watch how you eat them. And balance eggs with other healthy fiber-rich foods such as fruits, vegetables, and whole grains. The Documentary film “What the Health”, the eggs-equaling-five-cigarettes-a-day comparison comes from a focus on eggs’ dioxin content. Dioxins are highly toxic compounds that accumulate primarily in the fatty tissues of animals. The WHO calls them a “known carcinogen”—which would point to eggs being super unhealthy. Functional Medicine Doctor says: ”A diet rich in organic, pasture-raised eggs and other animal products has ample amounts of bioavailable true vitamin A, which is only found in animal products. Vitamin A down-regulates the toxic actions of dioxins.” Meaning, essentially, that eggs contain the bad stuff (dioxins), but because of nature’s intelligence, they also contain good elements to prevent the bad stuff from wreaking havoc on your body. Cole also points to the high-dioxin content of various plant-based foods. ” Research has found that, other than fish oil, which isn’t consumed in high amounts, rice was the most concentrated source of dioxin toxins. Selenium: Nutritionally speaking, selenium is essential to humans. It plays vital roles in DNA synthesis, thyroid hormone metabolism, reproduction, and protection against oxidative damage and infection. Vitamin B2 (Riboflavin): When you get a ton of vitamin B2 in your diet, you will notice your urine turn into a bright yellow color. Besides giving a darker shade of pee, vitamin B2 gives vital support to iron metabolism, antioxidant protection, and energy production. Iodine: If you’ve ever done the simple science test for starch in a potato, then perhaps you are familiar with iodine. In a dietary sense, iodine supports your thyroid gland and is a fundamental component of hormone production. Phosphorus: Phosphorus is a key component in making sure your bones stay healthy and strong, balancing vitamins in your body, managing, making, and storing energy, producing your genetic building blocks (DNA and RNA), muscle contraction, and many other crucial bodily functions. 3. Kind of egg matters. Not all eggs are treated equally. Egg depends on its mother’s health state. How the hen has raised matters the most. There are many labelings on Egg cartons in a supermarket. 67-square inch space each hen. They never see the light of day and consume a corn or soy diet. 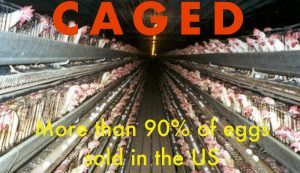 Over 90 percent of eggs in the U.S.come from hens that are kept in cages for their entire egg-laying lives. These ladies have more room than caged hens since each is given less than 1 square foot. Still, they’re not entirely “free,” since they’re confined to barns and consume a corn or soy diet. Allotted less than 2 square feet per hen, Some seldom get to see the light of day and many eat a corn- or soy-based feed. You will see this label on eggs originating from hens that were allowed outdoors at least for part of their days. Typically, this means the hen was granted access to sunlight. 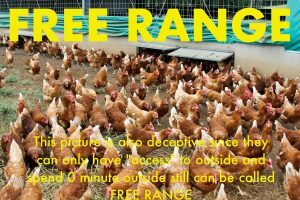 The term “Free-range” is used differently from country to country. 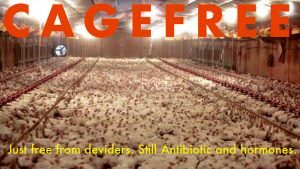 For chickens, “free range” means the birds must “have access to the outdoors for an undetermined period each day, according to the USDA. In practice, this can mean the chickens live most of their lives outdoors, retreating to their coop only when weather or other factors require them to do so, or it can mean the chickens spend all their time in cramped, indoor pens that have a small door opened to the outside for just a few minutes each day. 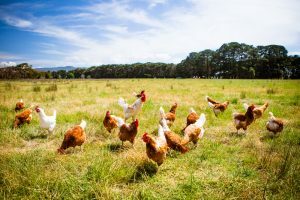 If poultry is certified “free range” as part of the Humane Farm Animal Care (HFAC)’s Certified Humane program, it means the chickens spend at least six hours a day outdoors (weather permitting), and have at least two square feet per bird in their pens. The Certified Humane certification covers a variety of issues. A pasture is a patch of land covered with grass and plants, the ideal habitat for grazing livestock. These ladies are given at least 108 square feet each (If it is Certified Humane Certified) and consume some feed and lots of grass, bugs, worms and anything else they can find in the dirt. Pasture-raised chickens must be free to roam outside year-round, but also have a house for protection from weather and/or predators. 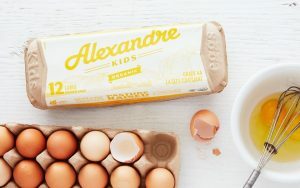 We talked about Alexandre Kids Eggs as one of the high-quality Organic Pasture-raised eggs. To qualify as organic, eggs must come from chickens that are fed only organic feed, i.e., feed that is free of animal by-products, synthetic fertilizers, pesticides or other chemical additives. No genetically modified foods can be used. Additionally, organic eggs must come from chickens that are given antibiotics only in the event of an infection. No hormones or other drugs can be used in organic egg production. Molting — when birds shed their older feathers to make room for new ones — is sometimes induced in commercial egg and chicken production by withholding food, water or by other means. Molting extends the productive life of laying chickens, but it cannot be induced in chickens laying organic eggs; only natural molting is allowed to occur. Organic eggs must come from chickens that live in cage-free environments and have access to the outdoors, even if their outdoor area is just a small pen or enclosed yard area. Pens are used to protect the chickens and their eggs from predators like hawks, foxes, raccoons, coyotes and other animals. The only difference in eggs labeled as “Omega-3-enriched” is that those hens were fed omega-3 rich sources, i.e. flax seeds. Though these eggs are higher in omega-3 fatty acid content, the amount doesn’t have that dramatic of an effect on your health, and the may even be unhealthy if the hen was fed a poor-quality omega-3 diet. When you see this label, you can be certain that the eggs came from hens that were not fed any animal protein. While this may sound healthy, a hen’s natural diet is not actually vegetarian and may include things like insects and worms. A vegetarian-fed label also tells you nothing about the treatment or living conditions of the hen. 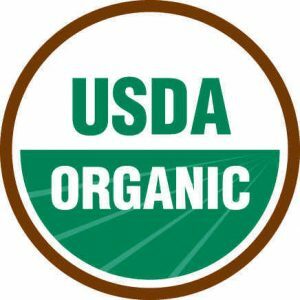 The United States Department of Agriculture (USDA) will also issue a grade or an inspection marking if the eggs were officially checked for quality (freshness) and sanitation. Grade AA eggs are usually the highest in quality and the freshest. In 2007, Mother Earth News magazine decided to test the nutritional value of pastured eggs from 14 different farms. They were measured in a lab, then compared to the USDA standard conventional egg. 4. Brown, White or Green? Believe it or not, the price isn’t actually an indicator of how healthy the eggs are. The main difference is in the type of chicken that lays the egg. In general chickens with white earlobes lay white eggs, and chickens with brown (red) earlobes lay brown eggs. Earlobe color is not necessarily the same color as the rest of a chicken’s feathers and not all chickens follow this rule. There are even green and blue chicken eggs out there! 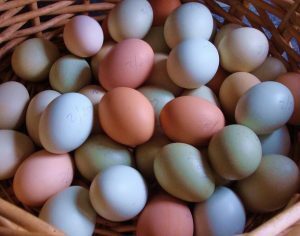 A pigment called oocyanin results in blue eggs, while porphyrins result in brown eggs. Color isn’t linked to nutrition. There are many different types of chickens bred for egg-laying. The most common are the Rhode Island Red, the New Hampshire, and the White Leghorn. Brown eggs typically come from larger sized hens, and because it is more expensive to feed the bigger hens they tend to be more expensive. This usually makes white-eggs the more cost-efficient choice. 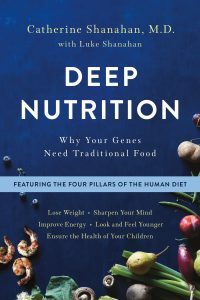 BY Catherine Shanahan, M. D.
This book covers a lot and I personally recommend this to really understand the toxicity and ill effects of vegetable oils and sugar to our health. Since she talks about Oil and fat a lot it also explains cholesterol and all other kinds of fat including Omega – 3, 6, and PUFA. To understand “Fat” and how important it is for your HEAD. 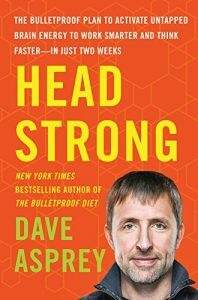 “Headstrong” – The Bullet Proof plan to activate untapped brain energy. Dave Asprey is one of the best guys out there to ask about fat, isn’t he? In this book the word “fat” appears nearly 300 times. “fat” is that important. I also know he eats eggs as his one of the main good fat sources. He talks about it a lot. Eliminate the sources of “kryptonite,” both nutritional and environmental, that make the brain slower. Supercharge the cellular powerhouses of our brains, the mitochondria, to eliminate cravings and turn up mental focus. Reverse inflammation to perform better right now, then stay sharp and energized well into your golden years. Promote neuron growth to enhance processing speed and reinforce new learning—hotwiring your brain for success.